You may have been confused by this question as well. Actually, it is well-known that the audible books are becoming more and more popular since it comes into being. 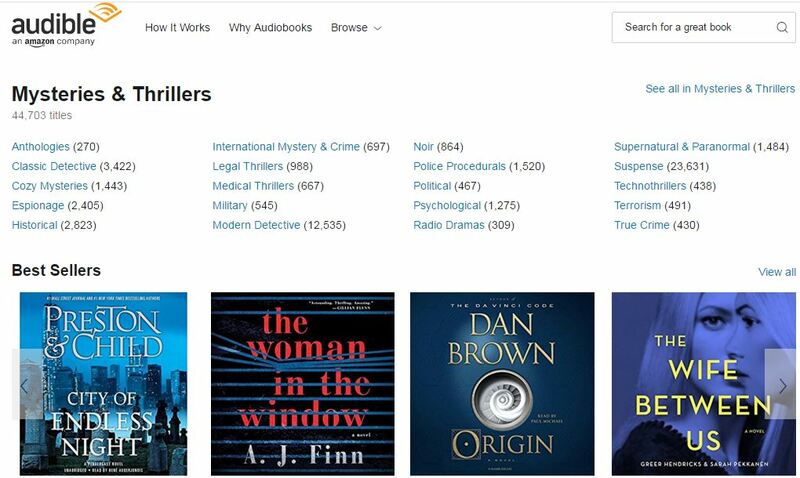 Because of the popularity of Apple devices and its qualified services, Audiobooks from iTunes has become one of the most popular audible books providers. However, there are also other ways for you to get free AudioBooks from internet and solution for getting DRM-free audiobooks from iTunes, which we’d like to mention here for recommendation. Part 2. 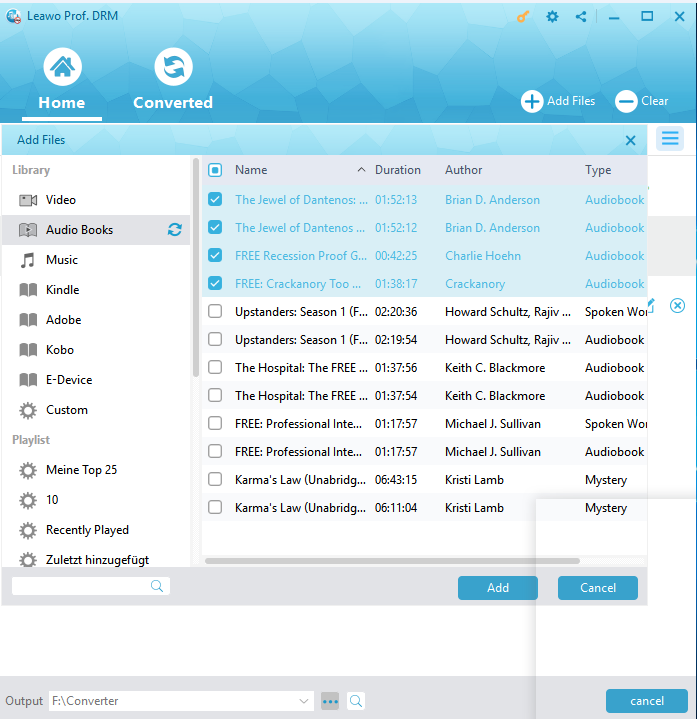 Extension: How to Get DRM Free AudioBooks from iTunes? As it pronounced, audiobooks can make you enjoy books in a whole new way with the great narrators making the story more alive. And you can make use of the time of your commute, workout, or chores to listen to the books. 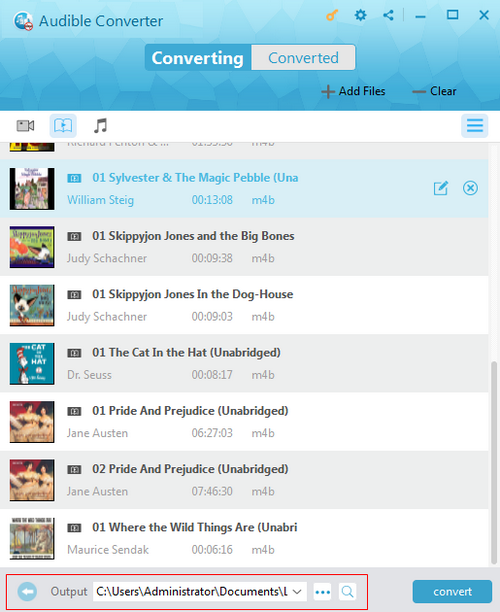 With the free audiobooks, you can enjoy yourself with the listening freely at anyplace and anytime. To get free audiobooks from internet for you, top 5 websites to get free AudioBooks are recommended here. Audiobooks.org is a great website which offers free audiobooks on internet. There are thousands of audible masterbooks which are famous worldwide. You can easily get free audiobook from internet you like here with just one click. 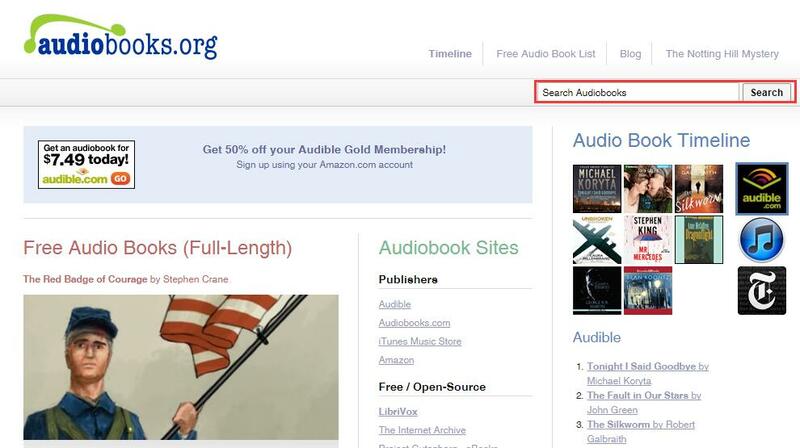 You can search your target audiobook in the search bar, and the audiobook will be listed, you can download your favorite audiobooks easily. Librivox.org is a non-commercial, non-profit and ad-free project which allows you to get free audiobooks from internet. Aiming at making all books in the public domain available, for free, in audio format on the internet, Librivox is powered by volunteers from across the globe in all languages as a library of free audiobooks. So you may find your target audiobooks in any language here. Luyalbooks.com is a popular public domain audiobooks and ebooks. It offers a number of famous and popular books in audible format so you can listen to or download it free. Almost all the categories of books are available here like Fiction, Mystery, Fantasy and so on. And there are peculiar audiobooks for Children. Almost all the popular masterpiece can be found here as well. Audiobooks.com is aiming at combining your love of books with your passion for technology and innovation to create a great service in audible books. 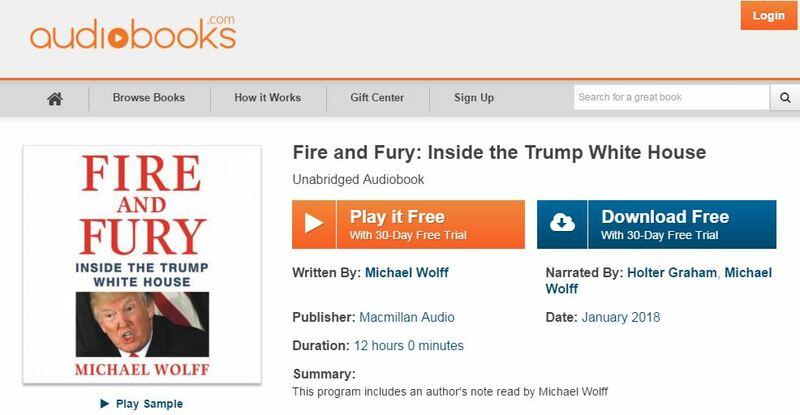 There is a 30-day free trial service so you can get any audiobook FREE during the trial time. And there are a bunch of audiobooks in this site you can enjoy yourself very much. Audible.com is one of the best audiobooks suppliers online which offers numerous audible books including almost all popular categories of books like Mysteries &Thrillers, History, Romance, classics, Science&Technology, etc. You can nearly find all your favourite books here for free with its 30-day free trial. To get free audiobook from internet, this would be one of the best recommended websites. Part 2. How to Get DRM Free AudioBooks from iTunes? You may have got familiar with the popular websites to get free audiobook from internet. And you must know that one of the greatest suppliers of audiobook is iTunes of Apple. However, you can subscribe some audiobooks for free from iTunes, but because of the DRM protection, you cannot play the purchased and rented audiobook without iTunes. How to get DRM audiobooks from iTunes then? You will get simple solution with the peculiar tool–Leawo TunesCopy Ultimate. Leawo TunesCopy Ultimate is a powerful iTunes DRM removal program and a DRM media converter as well. It helps you remove DRM from iTunes audiobook/video/music you purchased or rented, and then it can convert those iTunes protected M4V files to MP4, or iTunes M4B/M4P files to MP3 so you can get DRM-Free AudioBooks from iTunes and play it on ordinary media players or mobile devices. You can simply download and install Leawo TunesCopy Ultimate, authorize your computer by signing in with your Apple ID, and then start it to get DRM-Free AudioBooks from iTunes with the guide below. Click “Add Files” button in the program interface to add the iTunes audiobook on the pop-up “Add File” panel. View the imported files under the category “audiobook” and choose an iTunes audiobook file to click the “edit” button, then freely choose Channels, Sampling Rates and Bit Rates for keeping in the output MP3 audio file. Set an output directory for containing output MP3 file by clicking “…” button at the bottom of “Home” list. Click the blue “Convert” button at the bottom, and then it can automatically remove DRM from M4B and convert M4B to MP3 in a while. Note: A pop-up dialog may ask you to trust the computer. You need to enter your Apple ID and password to continue the process. Now you get DRM-Free AudioBooks from iTunes, and you can click “Converted” tab to check all the converted files. To sum up, there are listed top 5 websites to get free AudioBooks so that you can enjoy your favorite audiobook freely. Absolutely, you can simply get free audiobook from internet on these sites by downloading these audible books or listening online. Moreover, with the professional removing and converting program TunesCopy, you can even get DRM-Free AudioBooks from iTunes in simple steps. Just feel free to be a great future “reader” with audible books from then on. Can I Watch TV Shows and Movies Bought with iTunes on the new Samsung Galaxy Tab 10.1 Tablet? How to Transfer iTunes DRM M4V Movies to One Plus?